Survey: 53% of Employers Concerned About Retirement Plans, Brain Drain | Challenger, Gray & Christmas, Inc.
“Simply because more workers expect to remain employed beyond the traditional retirement age of 65 does not mean they will. Nor does it mean that they will stay with their current employer. With the leading edge of the Baby Boomer generation reaching age 68 in 2014, it is critical that companies understand their exposure to brain drain related to retirement,” said John A. Challenger, chief executive officer of Challenger, Gray & Christmas. Currently, there are roughly 24 million 55- to 64-year-olds in the American workforce. That represents about 19 percent of all workers 25 and older. While that is the breakdown for the nation as a whole, the proportion of older workers varies widely from company to company. In a small sampling of human resources executives by Challenger, 20 percent said that as many as 50 percent of their workers were 55 and up. About 30 percent reported that workers 55 and older accounted for 11 percent to 20 percent of their workforce. 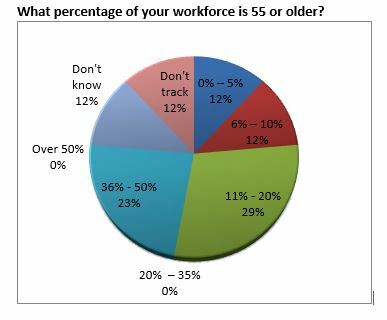 Surprisingly, 12 percent of respondents indicated that their companies do not track the portion of their workforce nearing retirement age. According to recent surveys, many of these aging employees are planning to continue working beyond the traditional retirement age. In its annual retirement confidence survey, the Employee Benefits Research Institute (www.ebri.org) found that 44 percent of workers age 55 and older now expect to retire when they are 66 or older. That is up from 29 percent who thought they would be working beyond age 65, when the survey was conducted in 2003. As another survey found, though, what one expects to do is not always what ends up happening. In a study by PNC Financial Services Group Inc., 49 percent of Americans in their “prime retirement planning years” intend to work longer than expected to shore up their retirement accounts. However, more than half — 58 percent — of those 70 and under who have already left the workforce did so sooner than planned. “The latest data from the Bureau of Labor Statistics’ job openings and labor turnover survey show that on average 366,000 American workers are voluntarily ‘separating’ from their employers each month due to retirement, disability or death. Workers who do stay in the workforce may decide to leave their current employer for a new industry, a new geographic location, to work part-time or volunteer. The point is, employers cannot count on their most experienced to stick around based on some national surveys,” said Challenger. According to our survey, the majority of employers (59 percent) rely on department managers to stay informed about their staff’s potential retirement plans. Only about six percent use employee surveys to gauge possible retirement activity. Thirty percent don’t take any steps to anticipate retirement activity; opting to learn about retirements only when employees initiate the process. For the companies that do track retirement, only six percent expect more than one-tenth of their workers to retire within the next two to three years. Nearly a quarter said that 7.0 percent to 10 percent of their workers are set to retire with three years. For most companies, though, the biggest concern is not the number of workers retiring, but the skills they take with them when they depart. Nearly 24 percent of respondents said their companies are very concerned with the coming retirement surge due to the fact that those planning to leave are in key, hard-to-fill positions. Another 30 percent were somewhat concerned with the potential increase in retirements. 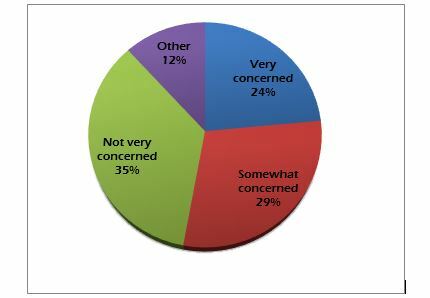 Meanwhile, about 35 percent indicated that they are not very concerned, due primarily to the fact that they have a large employee base from which to promote and fill positions being vacated by retirees. “Small to medium size companies will probably feel the biggest impact of any retirement surge that comes to pass. Their size means that they are less likely to have a deep pipeline of talent to feed into the positions left by retirees. These companies may need to do more to retain their most experienced talent. “Instead of letting these workers leave for less demanding job opportunities, for example, employers may want to find a way to cut the individuals hours and responsibilities. The person may be willing to accept lower pay and benefits in exchange for more flexibility to travel, volunteer or enrich their lives in other ways. Meanwhile, the company can continue to benefit from the continued employment of someone who can mentor younger employees and ensure the succession of specific corporate knowledge from one generation to the next,” said Challenger. “However, companies cannot determine what steps to take to address their retirement risk until they actually determine the extent of that risk. They should be looking at the age breakdown of their workforce and finding ways to measure possible retirement activity for immediate future, as well as five, ten and fifteen years out,” he advised.